Dedede Burst (デデバースト, Dedeburst) is King Dedede's Final Smash in Super Smash Bros. 4, replacing Waddle Dee Army. When activated, King Dedede Inhales his opponents, before slamming them with three flaming hammer spins, then finishing the move by throwing a bomb at the victim(s). The attack deals total damage of 46%. Each flaming hammer spins deal 10% damage, the fourth hit deals 1% damage, and the bomb explosion deals 15% damage. This Final Smash can KO at around 45%. Unfortunately, the first two hits deal very little fixed knockback, which makes it possible for most fighters to escape from the Final Smash before it finishes. 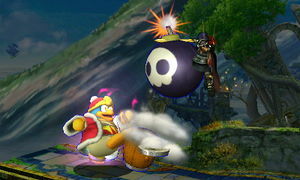 While the move itself is unique to Super Smash Bros., the bomb Dedede throws at the end of the move resembles the Bomber enemy from the Kirby series. These enemies explode if Kirby gets too close to them, or if they fall to the ground from a cliff. Additionally, if Kirby swallows a Bomber, he obtains the Crash ability, which lets Kirby perform a huge explosion to wipe all onscreen enemies. Also, in Kirby's Adventure, an egg-catching mini-game also involves Dedede throwing bombs that end the mini-game if caught. Dedede's spiraling inhale move looks similar to his inhaling attack as Masked Dedede, who appears in Kirby Super Star Ultra and Kirby: Triple Deluxe, and Shadow Dedede from the franchise's sub-game: Dededetour, which itself is similar to the Hypernova ability from said game. The explosion caused by the bomb resembles the explosions of the Balloon Bomb items found in Kirby's Return to Dream Land. The flaming hammer spins bear a reminiscence of Dedede's hammer flip attack from Kirby's Return to Dreamland as a playable character in multi-player mode (although his hammer doesn't light up in flames while charging up the attack), and Kirby: Triple Deluxe as the sole playable character in the Dededetour sub-game. For Dedede's Final Smash, he takes a deep breath, pulling his foes toward him. Once he's gotten them right where he wants them, he'll unleash blows from his giant burning hammer. Topping things off is an explosive from the end of the hammer, sending enemies flying. Could this be worse for his foes? Yes! He's invincible the whole time too! For Dedede's Final Smash, he inhales fiercely to pull foes towards him. Once he's got them right where he wants them, he thrashes them with a giant burning hammer. Then, to top it off, he fires an explosive from his hammer, sending them blasting off. Could it get any worse? Well... yes - Dedede's invincible the entire time. Inhaling at the start of Dedede Burst. 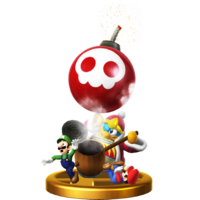 The bomb flashes red during the attack in Super Smash Bros. for Wii U, but not in Super Smash Bros. for Nintendo 3DS. When King Dedede is equipped with Double Final Smasher equipment, and his Final Smash misses, he gains the Final Smash glow as soon as his fail animation ends, but the glow disappears almost immediately after, so he cannot use his Final Smash again. This page was last edited on December 5, 2018, at 01:10.